Those other guys and gals who write stuff here at The Hayride work their butts off tryin’ to make sure all our readers know what’s goin’ on at the Capitol, and that ain’t easy – most of it is borin’, and it’s depressin’, and lotsa times it’s just plain dumb. And then somethin’ happens up there that has nothin’ to do with the bills they’re passin’ at the Legislature and THAT’S what y’all care about. We all know this. It ain’t a surprise. So when late Tuesday night at one of them waterin’ holes in downtown Baton Rooidge where some of the leges like to get together and drown they sorrows there was a scuffle, y’all all wanna know all about that. Two lawmakers’ argument over legislation came to blows in a downtown bar Tuesday night. According to a report from the News Star, State Rep. Stuart Bishop and state Sen. Norby Chabert were the two involved in the fistfight at the River Room on Laurel Street. Bishop said Chabert got several punches in during the confrontation. “We had a gentleman’s disagreement and settled it with our hands,” Bishop told the News Star. The fight reportedly stemmed from a disagreement over legislation at the state capitol earlier that day. “He’s not happy with me over a bill,” said Bishop, who blocked a bill from Chabert as chairman of the House Natural Resources Committee. Bishop claims they are longtime friends with similar priorities. He added that he wasn’t hurt and did not return Chabert’s punches. Police were called to the bar, but the two had already settled their squabble and left the business by the time officers arrived. Bishop – who’s known for an occasional tipple and who can prolly speak to the ol’ saying that nothin’ good happens in a bar past midnight – caught hell from his colleagues, after he hadda take to the floor yesterday and apologize, though it sounds like he didn’t exactly do a lot. Word is it was Chabert who was throwin’ punches rather than Bishop. 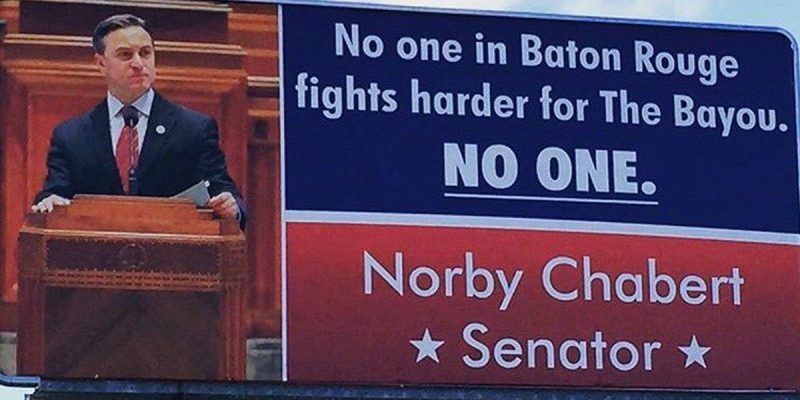 Nobody in the Senate did Chabert like that. Whether somebody told him “Lighten up, Francis” or not, we couldn’t tell ya. What the bill was that Chabert was mad about that Bishop killed, or amended or somethin’, in the House Natural Resources Committee he chairs – couldn’t tell ya. Norby’s bills are all coastal protection stuff, which is all fine but way too in the weeds for a nutria from Barataria Bay to tell y’all about. Point is, Bishop did somethin’ an’ Norby had him a few gin fizzes or appletinis in him and he hadda express his frustrations some kinda way. Unless it was Norby’s bill makin’ the Cajun waltz the official state dance, but that one never made it over to the House. Everybody knows the state dance is either the electric slide or the Cupid Shuffle. The Cajun waltz is like third, maybe, no matter how pissed off that might make Norby after he’s had too many Zimas. Our guy MacAoidh knows all about that stuff. Funny how the busiest post on the site yesterday, they tell me, is the one he wrote last year about how Norby tried to break his finger in a late-night confrontation which sounds an awful lot like the one Tuesday. There’s a pattern here, which is that this cat gets loaded an’ wants to tell people off about stuff they do that he don’t like, an’ when his intended victims blow him off he gets aggressive and then there’s a fight. Except there never seems to be any real damage. At some point there will be, because he’s gonna irritate the wrong dude and then he’s gonna end up like a side of beef in a Rocky movie. But so far it’s kinda a big joke that once a year Norby is gonna pull his Fightin’ Coonass routine and everybody gets to snicker about it. It’s a shame he’s gettin’ termed out before he can get punched out. Or somethin’ – I dunno. Either way, y’all might wanna stay out the River Room past 10:00 or so on a weeknight until the session’s over, else this dude decides he wants to take a poke at you, too.